At least 71 people were killed Friday in Myanmar's strife-torn Rakhine State when Rohingya Muslim insurgents launched simultaneous predawn attacks on 30 security outposts, police stations and an army base, according to the government's latest update. 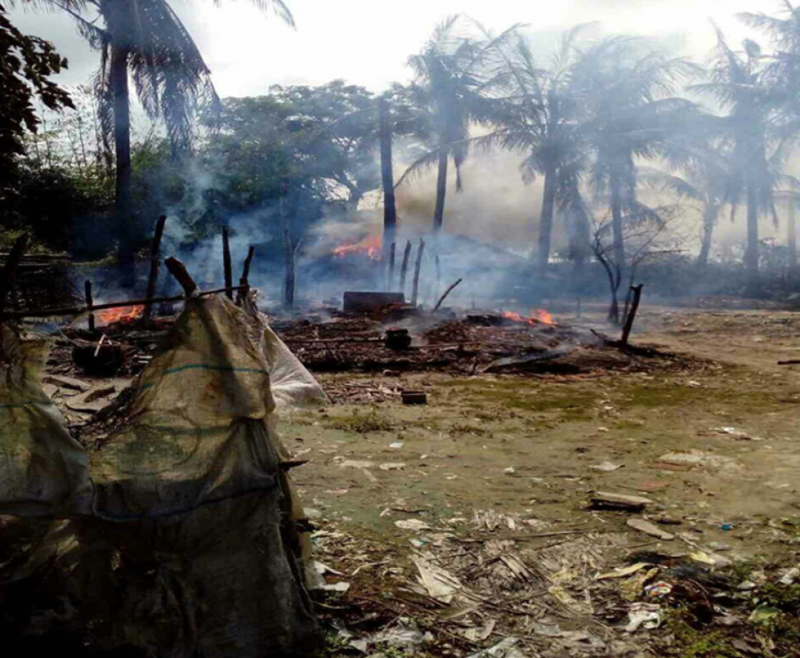 It earlier said clashes broke out in Maungdaw district of northern Rakhine around 1 a.m. when "extremist Bengali terrorists" attacked security outposts and police stations in 24 separate locations in the area, which is mostly populated by minority Rohingya Muslims. The government of the predominantly Buddhist country typically refers to the country's stateless, marginalized Rohingya in Rakhine, formerly called Arakan, as Bengalis, viewing them as illegal immigrants from neighboring Bangladesh. Several hours after the first attacks, around 150 insurgents attempted to breach a military base in the district. At least six guns were lost to them. 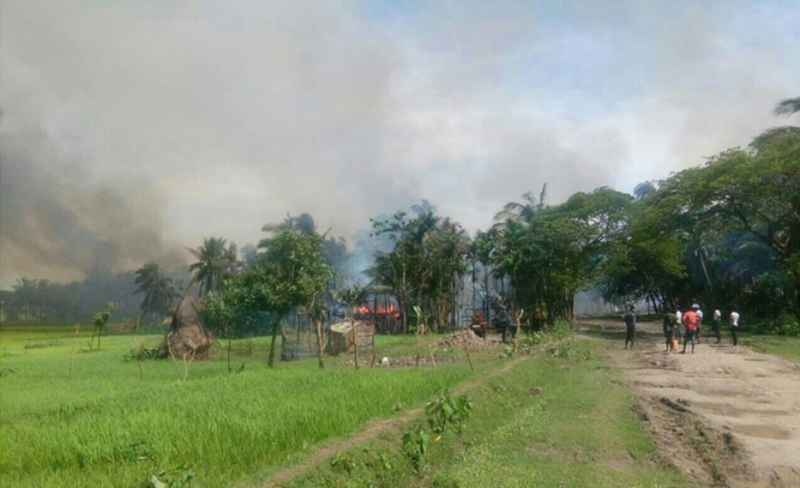 Attacks at security posts continued into the afternoon, with three police cars in Maungdaw destroyed by explosives. The reported fatalities comprise 59 insurgents, 10 policemen, a soldier and an immigration officer. Security forces managed to capture one of the attackers. A health worker who survived an attack at police station said scores of people stormed through the gate and some tossed handmade explosives into the rooms where some police had been sleeping. The government said some Muslim villagers in Yathetaung township in the vicinity of the attacks burned down their dwellings and fled into the nearby Mayu mountain range where the military has reported finding insurgent training camps. The Arakan Rohingya Salvation Army, a group previously known as Harakah al-Yaqin, reportedly claimed responsibility for the early morning offensive. A statement apparently posted by the group on social media said it is "taking defensive actions against the Burmese marauding forces" in response to atrocities committed in the northern Rakhine and a two-week government blockade affecting its people there. In a statement issued in the evening, Myanmar leader Aung San Suu Kyi condemned the "brutal attacks" and commended the security forces for acting "with great courage in the face of many challenges." She called the attacks "a calculated attempt to undermine the efforts of those seeking to build peace and harmony in Rakhine State," adding, "We must not allow our work to be derailed by the violent actions of extremists." She said the government remains firm in its commitment to finding "meaningful and lasting solutions to the issues in Rakhine" and reiterated that she welcomes the "constructive approach" taken by the Advisory Commission on Rakhine State, which issued its final report the previous day. In the report, the commission, led by former U.N. Secretary General Kofi Annan, warned of the risk of fresh rounds of violence "unless concerted action -- led by the government and aided by all sectors of the government and society -- is taken soon." The commission's report contains 88 recommendations for the government on such things as socioeconomic development, citizenship, and freedom of movement. 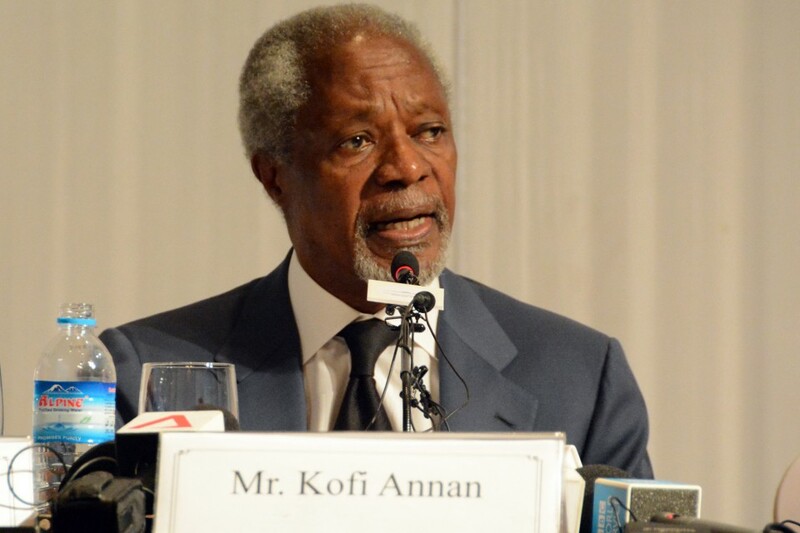 Annan also issued a statement Friday afternoon condemning the attacks, expressing grave concern and calling on the security forces to exercise restraint in dealing with the situation. "The alleged scale and gravity of these attacks mark a worrying escalation of violence. No cause can justify such brutality and senseless killing," he said. Friday's incident marks the first such major attacks by the insurgents in Rakhine since Oct. 9 last year when nine border police stations and outposts in the region similarly came under simultaneous attacks, resulting in the deaths of nine officers and eight attackers. The group that instigated the previous attacks is reportedly the same as that which claimed responsibility for the latest ones. After the Oct. 9 attacks, the military responded with "clearance operations," raiding villages in search of culprits, arresting hundreds and causing tens of thousands of people to flee their homes and head across the border into Bangladesh. More than 100 people, including 17 security officers, were killed during subsequent clashes between security forces and insurgents. In recent months, efforts by extremists to recruit and train villagers in northern Rakhine have been exposed, causing concern for the government over the spread of radicalization among the populace. Nearly 60 villagers, mostly Rohingya Muslims who are reportedly close to the authorities, have been murdered there, and at least 33 more have gone missing or been abducted since October.